One thing I really enjoy about my office environment is the random conversations I have with my co-workers. Today, for example, my colleague Brandt and I were discussing the apparent lack of raccoons in northern Virginia because he was concerned about rodents getting into his bird feeder. Then the conversation steered toward Hot Meats, which, besides having an awesomely awkward name, are touted as the bird lover’s ultimate rodent repellent. They’re sunflower seeds that pack a punch with hot chile oil, which squirrels do not like. I told him that if he REALLY wants to teach a squirrel a lesson, he should lace the Hot Meats with ghost peppers, or bhut jolokias, which are a northeastern Indian hybrid pepper that has been rated the hottest in the world. A single ghost pepper can have a rating of over a million heat units on the Scoville scale. Let’s put that number into context, shall we? Tabasco, which is pretty hot if you’re a wimp, comes in at 2,500 to 5,000 on the Scoville scale, while pure capsaicin, which gives pepper plants its spice factor, has a rating of 16,000,000 heat units. Holy hell, that’s hot. The Ghost pepper will send your taste buds to their graves. 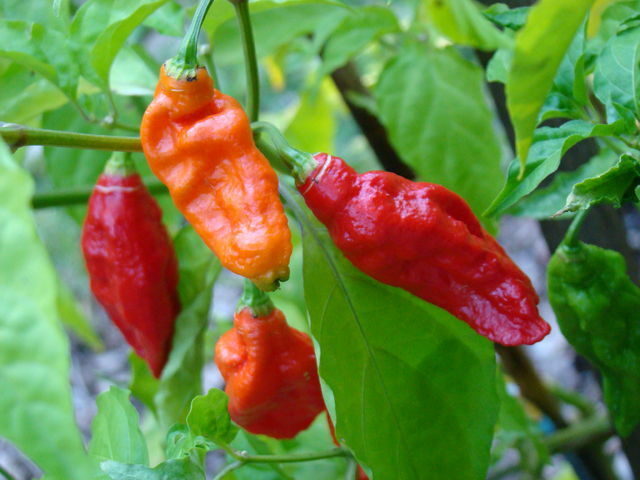 After a quick search, however, I was surprised to find out two things: that the feared bhut jolokia pepper has been surpassed by a pepper with an even more menacing name, the Trinidad Moruga Scorpion pepper, and that the bhut jolokia’s Westernized name, the ghost pepper, is actually an erroneous translation. Whoops. At any rate, there’s no misinterpreting the Scorpion pepper’s moniker, which pretty much lives up to its namesake with a sting that rates 2,009,231 Scoville heat units. That’s TWICE as hot as the ghost pepper! I love spicy food, don’t get me wrong, but you couldn’t pay me enough to eat one of these suckers. I mean, look at what it can do to a grown man! (Warning: Do not try this at home.) However, if you’re interested in growing your own Scorpion peppers and goading a frenemy into eating one (while secretly filming his or her reaction) check out this site. Have you ever had a Trinidad Moruga Scorpion or bhut jolokia? What’s the spiciest thing you’ve ever eaten?